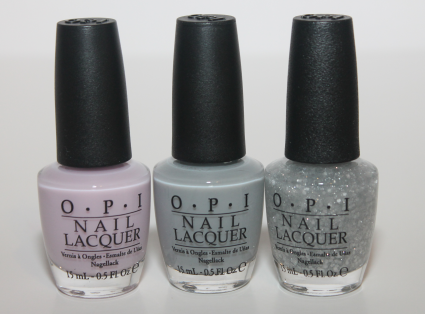 OPI recently partnered with the New York City Ballet and introduced six new soft shade nail polishes. The collection is inspired by ballet dancers, choreography and costumes which all form together to create a range of soft feminine hues. The beige, pink, and white lacquers bring to mind classic ballet slippers, tutus and leotards, while the sheer lilac and gray add muted color to ballet’s traditional pink. Barre My Soul, You Callin' Me A Lyre?, Don't Touch My Tutu! You Callin' Me A Lyre? Glow: I do love the soft shades color idea and I think these colors go perfect with the ballet theme. The colors are soft-sheer jellies. My favorites are definitely You Callin' Me A Lyre? which is the pretty soft pink and Pirouette My Whistle the glitter, I can see this glitter getting a lot of use and I think it would look great on top of more prominent vibrant colors. Glare: These shades are a little too much on the sheer side for my personal taste. It took 4 coats just to get them to show up semi-opaque. Would I Recommend It? Ehh yes, if you're into super subtle colors and jellies. I'm just not a huge fan of jelly-like polishes. While I do love the idea with these, the overall NYC Ballet Collection just doesn't do it for me. Where To Buy: The New York City Ballet collection is currently available at various retailers nationwide at $8.50 each. To learn more, find a retailer near you, or to purchase please visit www.opi.com.